Leighton Town’s miserable start to life in the Spartan South Midlands Premier Division continued on Saturday as they went down 3-1 at home to Hadley. Since their relegation from Evo-Stik Division 1 Central last season, Town are yet to pick up a win in their new surroundings, and with only a draw to their name, they sit second from bottom. But Town went into the game on Saturday facing a Hadley side with a similar record, having picked up just two draws from their opening league matches. And predictably, given the positions of both sides in the table, the opening exchanges lacked quality. Town striker Matt Bateman did win a free-kick in a good position on the edge of Hadley’s box and whilst it was a probing cross into the area it was well cleared. Both teams struggled to create chances at the start of the first half and it wasn’t until Nick Chrysanthou’s well wide shot that the first effort of the game was chalked up. 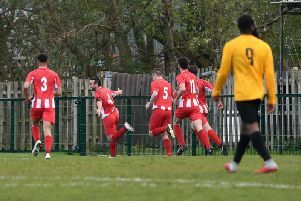 Leighton nearly put themselves in danger after a bit miscommunication between Mark Smith and Jack Sillitoe in the Leighton goal over clearing a cross but the danger was averted. Sillitoe had to deal with a long shot from Zaine Gangadeen not long after but it was comfortable for the ‘keeper. Hadley had started to play some good football and were then rewarded with this when Hesham Benmansour had a free header but Sillitoe did very well to claw it out. But in the 29th minute their efforts were rewarded. Some poor defending meant that Chraysanthou and Benmansour were able to link up in the box and it was Benmansour who did well to coolly slot it past Sillitoe and into the bottom corner. The goal woke Town up and they had arguably their best chance of the game when an inviting cross narrowly missed Bateman who was in a great position to head home. Hadley nearly made it 2-0 Bilal Sanchez with a lovely turn and shot that was blocked as far as Benmansour who mishit it in a good area and forced a save out of Sillitoe. However on the stroke of half time Leighton equalised; Matt Hewitt made a neat run on the left wing and pulled it back for Ben Gallant, he laid it off for Maisiri who struck from 25 yards to beat Sam House and draw level. Leighton were a much improved side in the second half as they exchanged blows with Hadley. But seven minutes from the end, Hadley would be given a huge slice of luck to retake the lead. This second half was almost like a pendulum at times and it swung back into Hadley’s favour when their referee gave them a penalty after he said that Zaine Gangadeen was fouled. Chrysanthou stepped up to take it and sent Sillitoe the wrong way shooting into the right corner in the 83rd minute. Leighton tried to get it back to 2-2 when Bateman played in Campbell his shot was saved it came to Davis and ended with the same result. Any chance of a Leighton comeback was soon extinguished when Hadley were awarded a second penalty when the linesman deemed Elliot to have handballed it inside the box. Chrysanthou stepped up again and again slotted to the right past Sillitoe in the 93rd minute and 3-1 it finished in favour of Hadley. Leighton Town travel to take on Levistock Green next Saturday.